Students from Lakeshore Discovery Public School celebrated World Down Syndrome Day by hosting a Just Dance in their gym on March 13th. Students who wanted to rock their socks off donated $1 to participate. Sue Bolton, an Educational Assistant from Lakeshore Discovery Public School spearheaded this event and presented Andrew with $661. He will donate the proceeds to Up About Down, the Windsor-Essex Down Syndrome Association for future cooking classes. The Association has funded cooking classes in the past that Andrew enjoyed. 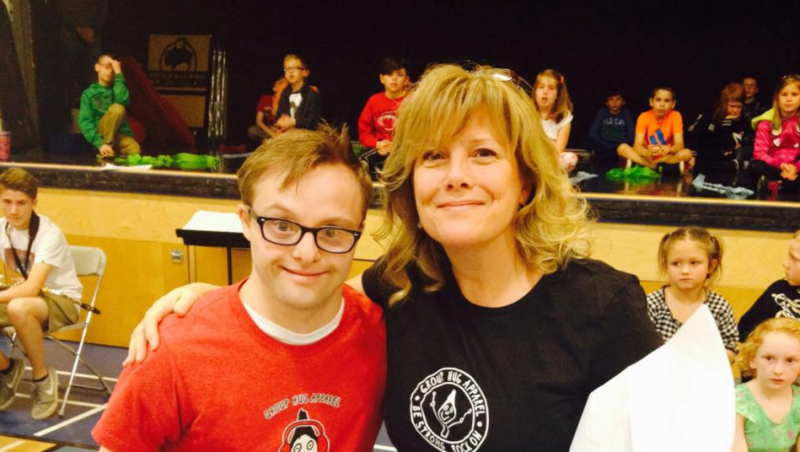 Andrew spoke to students, staff and parents thanking them for their generosity along with sharing his most recent news of being chosen a Canadian Down Syndrome Hero. As a mom, seeing Andrew so confident in front of 800 people really makes me proud of everything he sets out to do in this world. Thank you Sue and Lakeshore Discovery Public School for being so supportive and kind.